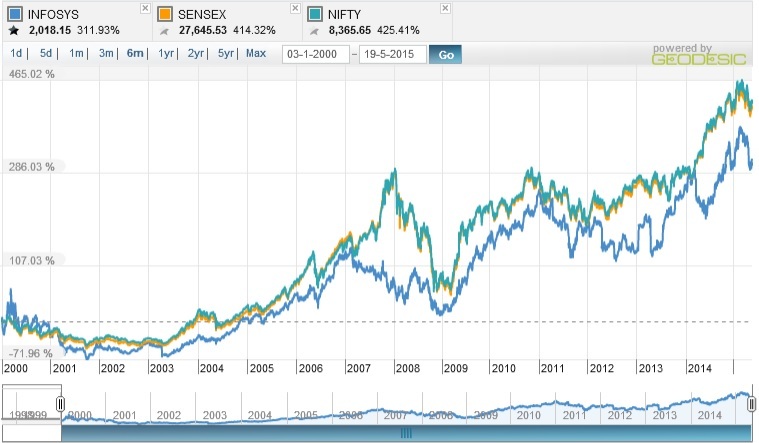 We will take a quick look at two companies (INFY) and (MSFT) that was trading at close to 310 historical PE and 58 respectively in 2000. This was at the height of the bubble. Something common in addition to being IT companies, both companies boasted of good managements, great business model and a long runway in front of them. The market was pricing the heaven on earth into their price. How did they turn out over the next 15 years? Infy sales on 2000 was 9210 million INR and net profits was 2930 million INR. In 2014, sales was ~530000 million INR and profits were ~100000 million INR. The sales multiplied 50X and profits went up 40X. MSFT revenue went up from $23B to $95B and net profits went up from $9B to almost $22B. The stocks is down -17% over the same time while the Dow Jones in comparison went up 60%. While the performance of the company was great, to justify the valuations the company had to grow 5-6X on net profit line instead of the 1.5X that they did during the same time frame. If you look at the companies above, the PE’s were high and despite a 50X improvement from INFY and 1.5X improvement from MSFT, they were not able to beat the market. In today’s context, when you see PE’s of some Indian companies, like Page industries at 89 PE, Symphony at 61 PE, Nestle at 54 PE, Glaxo Smith Consumer at 46X, Emami at 52X…. while they might have good managements and great business models, and over a long period of time you will not risk permanent loss of capital, beating the market might not be as easy as it looks. The odds are already stacked against the average investor who is buying at these PE’s. The thing that makes the art of stock picking interesting is the fact that it is always possible to identify great companies with good moat but they are usually bid up in price handicapping it against you. The key to success is to handicap it by not overpaying for these companies and wait patiently for the companies to come to you at reasonable valuations.